Home / SkinCare / Angela Langford - A Little Lift - Natural Skincare. 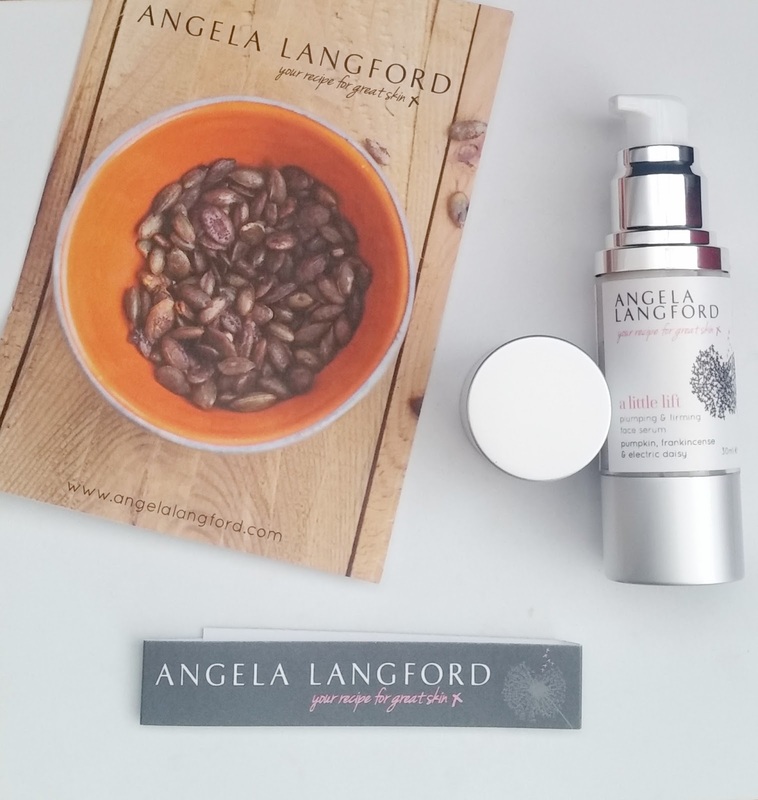 Angela Langford - A Little Lift - Natural Skincare. Natural and organic products are specially created by Angela Langford to involve natures beautiful creations to produce skincare products that actually work, without any harsh chemicals and nasty additives. 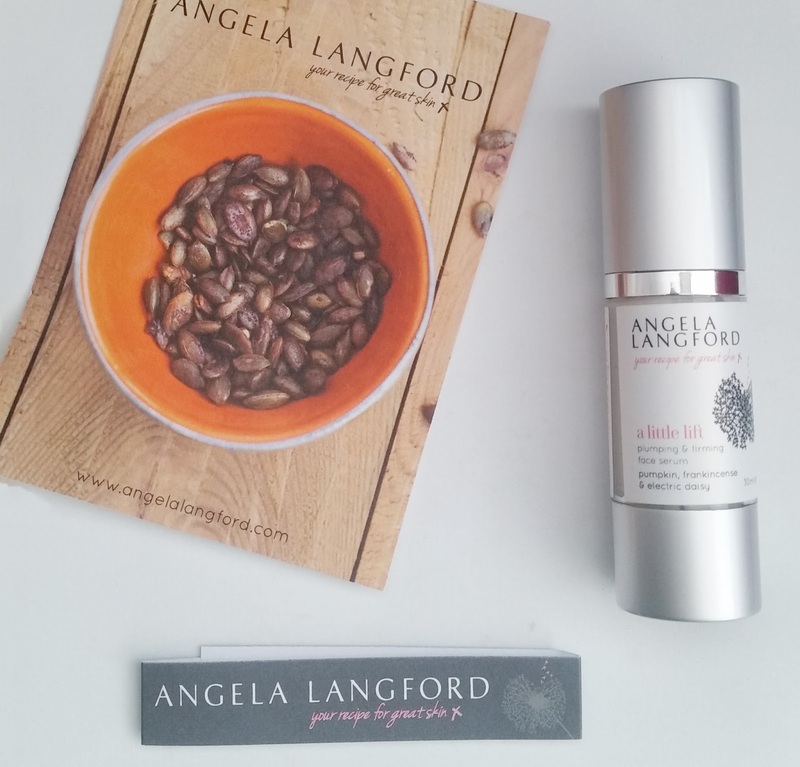 Receiving a little lift in luxury packaging, along with an information sheet and recipe card, a warm welcoming greets you to be introduced into the Angela Langford skincare brand. Angela's recipe cards are to show people how they can feed their skin from within, whilst the skincare product u have chosen involves the ingredient listed on the recipe card. The a little lift plumping and firming face serum contains pumpkin seed oil, whilst the corresponding recipe card i received is soy roasted pumpkin seeds, learning how we can feed our skin from within and the outside with natures larder. The a little lift plumping and firming face serum is a recipe for your skin if you are losing elasticity or tone, and your skin is in need of plumping and firming. The botanical super ingredient electric daises are mixed with pumpkin, frankincense and hyaluronic acid to help firm, refine and hydrate. Angela Langford has included key actives in a little lift to nourish and repair your skin but also protect it from the daily stresses each time its used. Spilanthes acmella flowers (electric daises) are a botanical ingredient that harnesses multi-tasking anti-ageing properties. Restructuring and firming the skin will improve smoothness of the skin reducing fine lines and wrinkles. Frankincense refines skin texture helping to reduce acne blemishes, the appearance of large pores and helps lift and tighten skin naturally. Rose water has anti-inflammatory properties that can calm irritated skin and helps skin retain moisture, great for mature dry skin types. Vitamins A, C & E are excellent antioxidants for the skin helping to repair damaged skin cells and protect your skin from further damage. Pumpkin is high in vitamins A, B2, B3, beta-carotene and zinc a combination that gives the oil a lifting effect, as well as lavishing any skin type with its natural properties. Mullein is a natural wrinkle fighter because of its high levels of skin-strengthening elastin, elastin helps skin return to its original position when its pinched or poked. Rich in omega 6, argan oil is a natural moisturiser to help hydrate and soften giving skin a natural boost. High levels of palmitic acid, macadamia oil helps to reduce the ageing process of the skin whilst also helping to restore the skins barrier function reducing water loss. Applying to a clean face, neck & decolletage, the pump dispenses just the right amount to apply to your face from your fingertips. Gliding over the skin with ease, the serum absorbs immediately when using your fingertips in a circular movement. The uplifting and natural scent calms your senses throughout application and your skin is left perfectly smoothed and hydrated, The serum does not feel sticky or heavy on the skin and does not leave skin looking greasy. You can use your favourite moisturiser and face oil over the face serum, which is useful when introducing a little lift into your skincare routine and especially if you like to layer your skincare products. Vegetarian & vegan friendly, fall in love with a little lift each time its used which can be morning and night, but remember to keep the bottle out of direct sunlight. Find out more about a little lift and visit the Angela Langford natural skincare range, your skin will thank you. X Neil.